Welcome back to the Etsy Conversations Podcast. Today my guests are Max and Cammi from Etsy Shop Gravlax. They were a lot of fun to talk to and I think you’ll enjoy getting to know them. 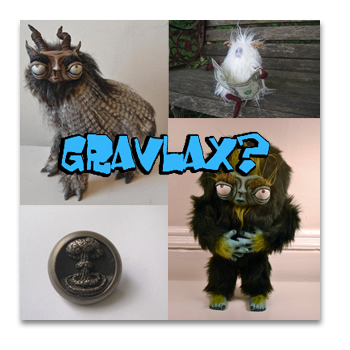 They have a blog you should check out at GravlaxCreations.blogspot.com and they can also found on FaceBook. Enjoy! I love how different this shop is! And how great to hear their background. I just saw Paranorman at the cinema, great film and so interesting to see personal work of the creatives behind the model makers. Really inspiring!